The EGU 2015 General Assembly will be held from April 12-17, 2015, in Vienna, Austria. ICDP is actively involved through the IODP-ICDP session, the ICDP-IODP/ECORD Town Hall Meeting and the joint ECORD/IODP-ICDP booth "Scientific Drilling". The IODP-ICDP session Achievements and perspectives in scientific ocean and continental drilling (SSP3.3.1/BG6.5/CL5.13/GMPV7.3) is scheduled on Wednesday, April 15, 13:30-15:15 and 15:30-17:15h, in room B1. 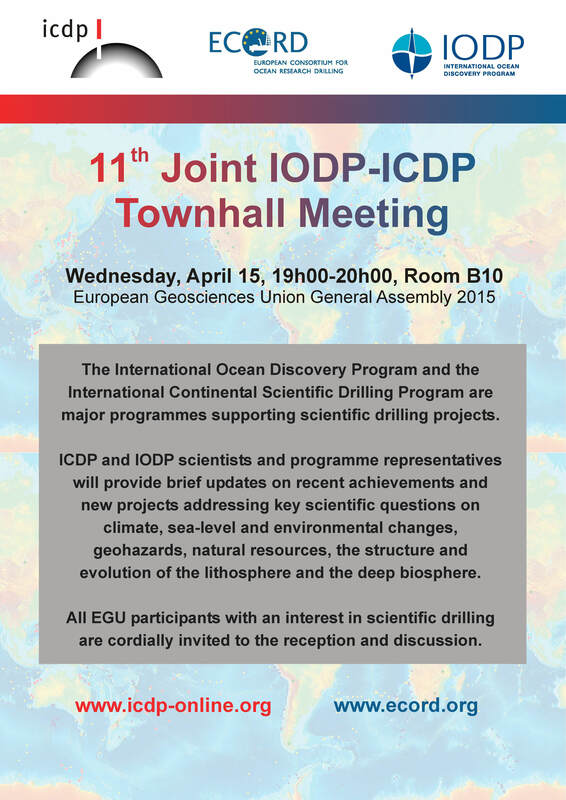 The ICDP-ECORD/IODP Townhall Meeting will be on Wednesday, April 15, 19-20h, in room B10. Meet ICDP scientists and representatives at booth #55/56/57 Scientific Drilling IODP-ICDP. The splinter meeting to plan for the Drilling Active Faults in Northern Europe (DAFNE) project (SPM1.54), Thursday, April 16, 13:30-15:00h in room R10. We are looking forward meeting you in Vienna!